Do you remember this match? Originally when the Igbos or Ibos settled in the present day Eastern Nigeria, they arrived with three leader two were spiritual leaders and the youngest of the three a hereditary King known as Obi a King by birthright. The first was the Eze Nri of Awka a Priest King, Of which I am their Son,also Their Younger Spiritual one, the second the Eze Aro of Arochukwu a King and the third the Obi of Nnewi a political and war ruler,Biafrans Reincated from The Three,and Cousins and Relatives who cames Across with them,Like,Some Yorubas,and Some Hausas,Because We migrated there in Different ways and Dirrection,But We are The Hebrews,or Jews,and I am also happy because the first thing I do in primary school was try to know how to read english,and Nigerian Government have been hiding our Identity for us,by killing our culture and tradition,teaching about another things but never teach us about our history,Many of us do not know our history because they did not learn in the school,no one teaches us,Most of our history still kept Oral,from Ancestors to Ancestor to Children,and that is the History that we are writing today,a lot of us Still living in other side of Africa undiscovered,I am happy when I saw many Igbo Jews writers writing everything they knows about our Jews Origin,Some like me who Is from Aguata,in Anambra State,Umu Nri,will be confirming some of them one by one,those that I knows because I can not write all the Igbo History,but if any igbos will tell us who the who is and where the mother come from we will knows who the Father is,Inu Igbo,Like One of My Brother Remi Ilona,have dome well,In Writing a lots of Books and His Interview in many places. TORONTO — It’s remarkable that finding the lost tribes of Israel, who were forcibly dispersed from the Holy Land some 2,800 years ago, still stirs the imagination. The Jews of Ethiopia, said to be the descendants of the tribe of Dan, are the best known. Most of them now live in Israel. There’s evidence the Pashtuns of Afghanistan consider themselves descendants of ancient Israel’s first king, Saul, while other groups have surfaced around the world staking a claim to the ancient Israelite heritage. Now, a barrister in Nigeria, Remy Ilona, asserts that the Igbo people of that western African nation are likewise Israelite descendants. “As a boy, I heard, like every other Igbo heard, that the Igbo people came from Israel. In primary school, you’re bound to hear that Igbo people came from Israel,” he said in a video lecture delivered last weekend. Ilona will speak through a recording at Congregation Darchei Noam to be held on Feb. 17 at 7:30 p.m. during Black History Month. The event, sponsored jointly with the Beth Emeth Bais Yehuda Synagogue and the Toronto Jewish Film Festival, included an excerpt of the new film, Re-Emerging: the Jews of Nigeria by director Jeff Lieberman, which will première at the festival in April. The research confirmed “what the Igbo always believed, that the Igbo descended from ancient Israelites,” he said. Ilona believes “97 per cent of Igbos agree that they are Jewish,” while the other three per cent don’t want to be associated with whites, who they see as colonial oppressors. Ilona dismisses those concerns. Reclaiming one’s heritage has nothing to do with colonialism, he maintains. However, a 2012 book review in the Nigerian Voice website offers the opposite conclusion, that the Igbo may have imbibed western culture, but the groups’ origins lie in the Holy Land. Igbo elder George Ojingwa writes in Igbo Kwenu that the people’s history goes back 4,000 years to the Shechnigbo clan, domiciled in the northern tip of Negev desert, south of Jerusalem. The author associates the Shechnigbo with the tribes of Benjamin and Judah, and according to him, in 740 BCE, they fled for safety when the Assyrians besieged Samaria. Moving south to Ethiopia, they eventually joined others heading to southern Sudan and finally to the northern Nigeria, arriving around 600 BCE. 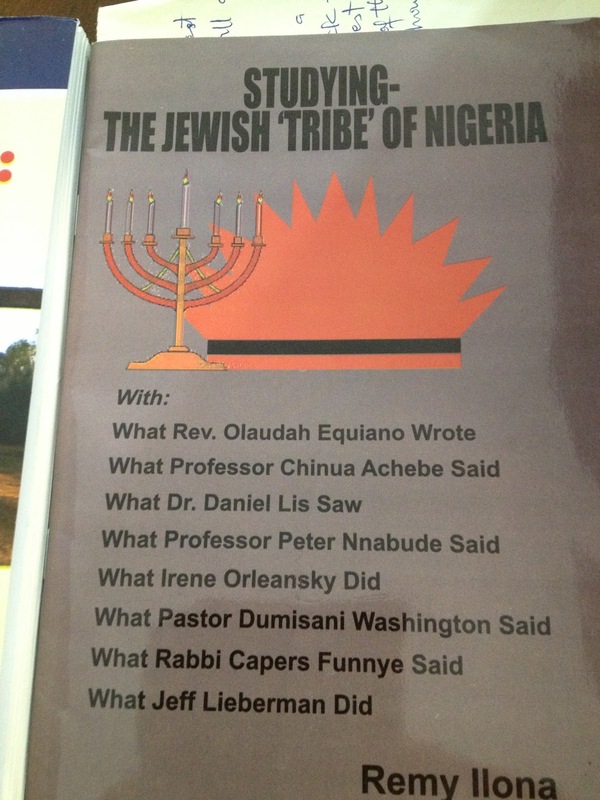 Ilona said the Igbo and the Jews share many customs. Like the Jews, the Igbo circumcise their male chidren on the eighth day; Jews marry under a chupah, Igbo under a similar canopy; both groups bury their dead quickly; the Igbo, like the Jews, mourn for seven days and around a month after the death, have a ceremony to mark the occasion. Both groups maintain a day of rest. About two per cent practice the traditional Igbo religion that is called Ome na ana. “Up to 90 per cent would say that they are Christians; one per cent would be Muslims; 5,000-50,000 practice rabbinic Judaism, five per cent practice Sabbatharianism, and the rest practice New Age religions. As for himself, Ilona leads a Jewish lifestyle, worshipping in a synagogue, living according to a Jewish calendar, celebrating Shabbat and festivals. “We follow every Jewish ritual as it is followed,” he stated. in 4th grade, my girlfriend Laurie told me I don’t have a Jewish nose. She hinted that I must have had a nose job. I hinted that she must be nuts to think a 10 year-old would have cosmetic surgery for such a thing. That was the closest I ever came to anyone questioning my Judaism. I was born a Jew, but it didn’t become relevant until decades later. When I attended Bible Study and church with a group of born-again Southern Baptist friends in high school, my story could have ended another way. When I fell in love with a man who knew so little about the Jewish people that he thought Jews were a separate race, my story could have ended differently. Chasdei Hashem, thanks to the many blessings Gd has bestowed upon me, I live today as a religious Jew in Israel. True, I had a ladder to climb to get to this point and there were trials along the way. But, except for Laurie, I never had anyone question my Judaism. I never had to prove my right to reclaim the heritage of my ancestors. It’s 2002. I am living in the US and working for an Israeli institution. I don’t yet know how dreams of aliyah will come to inhabit my every waking moment. I get an email from a stranger. I cannot tell from the name if this stranger is a man or a woman. The stranger, who turned out to be a man, told me about his people – the Igbo of Nigeria. As a result of British colonialism in the 19th century, the majority of Igbo are Christians. Of the 20 million or so Igbos still in Nigeria, most believe they are descended from the ancient Israelites. His group includes 5,000-7,000 people who left Christianity and are actively living a halachic Jewish lifestyle. The State of Israel has not yet officially recognized the Igbo Jews as one of the Ten Lost Tribes, but they continue to practice Judaism as best they can. 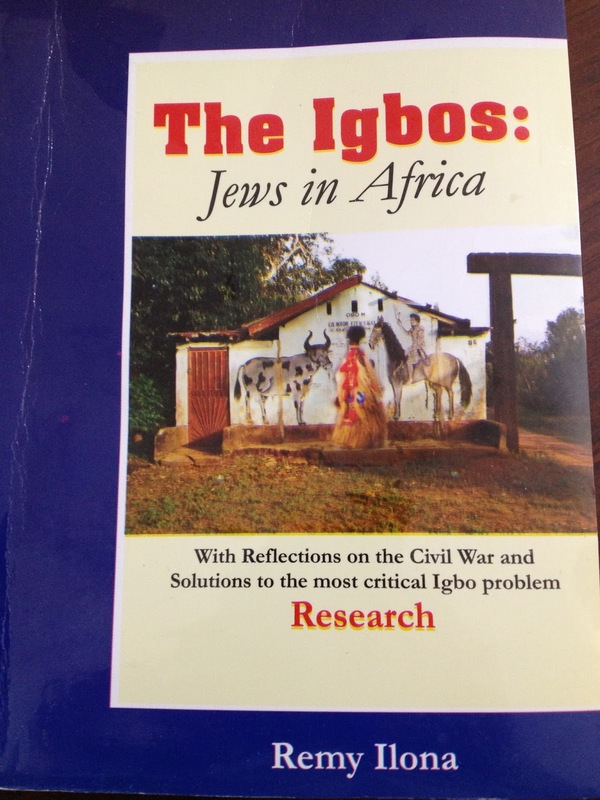 My original correspondent, Remy Ilona, an attorney and community activist in Nigeria and himself a member of the Igbo Jewish community, has been researching the numerous connections between Igbo practice and Judaism. He recently sent me two publications that reflect his momentous life’s work – connecting the Igbo Jews with the rest of the Jewish people. It’s 2006. I am visiting Israel for the 8th, 10th, 12th time. I lost count. Again through email, I connect with a woman named Yaffah tells me she was a lapsed Catholic from Texas, actually descended from those Jews who were forced to convert to Christianity in 15th century Spain and Portugal. As a result of being able to document her matrilineal line, Yaffah underwent a return ceremony, not a conversion, and rejoined the Jewish people. Her case is rare. Yaffah taught me the word anusim (much preferred over marrano) and told me there are millions of Bnei Anusim (descendants of the original forced converts) in the world today. Should they all return to the Jewish people, we would grow far beyond our current size. Earlier this summer, we had a house guest who came to us as a stranger and is now a valued friend. He is a member of the Bnei Anusim, living in a place where there is simply no option for a halachic conversion. In order to rejoin the Jewish people in Israel, he and his wife are facing a multi-step process – undergo a non-halachic conversion, make aliyah, live among religious Jews for at least a year and then begin their formal studies for a second conversion according to Jewish law. A final example. Seven months ago, I got a Facebook request from someone living in the southwestern US. Raised as a devout Catholic, he gradually came to understand that he is actually a Jew. Now he’s struggling with two major challenges – giving up his belief in Jesus and bringing his family along on his journey toward a Torah-true life. It can’t be coincidental that so many people all over the world are longing to be a Jew like me. I have no idea why Hashem keeps directing them my way, but I firmly believe that it is connected to the proximity of the redemption of the Jewish people. I scan the ranks of my unquestionably halachically Jewish family and friends and I recognize many individuals, all of whom I love, living as if Judaism is among the least relevant aspect of their identities. And then I think of the brave and searching souls I have known over the years whose pining to be recognized as part of Am Yisrael is so desperate, they are willing to turn their very lives upside down. If you’ll forgive a feeble sports analogy, I imagine that, in this time before the geula, Hashem is busy choosing who will be on His team for the Final Games. AT THE END I SHARED my view of supporting the Igbo Jews and Igbo Christians,with Daniel Lis,and He also gave me some of Ideas,It was nice meeting with His Family,The Kids playing with me was lovely,The Kids knows that I am Brother even if they do not knows me,but still,and with German Deutsch and Switzerland Deutsch ,we understood one another, Meeting with Other Jews here in Oldenburg Germany,was nice and hope of dreams or Vissions acomplished,It Took me a long way to find my self back to where I belong,I love Them all,Brother Rabai Jona Simon,and Sister Rabai Alina. and Juda and Family,and all the Families that have been supporting me have been so good to me,Meeting with Daniel Lis,and My Family is like Igbo Proverb been Translated and it apears to be reall and fact with figure,Nwanne di na mba,We are Jews and Jews lives everywhere,Our Families,our Relatives live everywhere in this world, Daniel Lis,Family are Inlaw to me,from Igboukwu Aguata in Anambra State,I love that when I heard It,and I promise to Give Him and Children and Wife,a Chieftaincy Title,because it is our Culture and Tradition,I have to say that I am happy meeting with Daniel Lis,and He is My Brother ,My Inlaw,My Family,He has done well and shall always remember in Igboland,Brother Remy Ilona has done well aswell,I my self,I am doing my Cultural and Traditional way,I suppose to be Levite,but Igbo people do not knows who I am,Nri Enwe ana,Levites, Igbo-Ukwu, a part of the kingdom about eleven miles south from Nri itself, practiced bronze casting techniques using elephant-head motifs. The bronzes of Igbo-Ukwu are often compared to those of Ife and Benin, but they come from a different tradition and are associated with the eze Nri. In fact, the earliest body of Nigerian bronzes has been unearthed in Igbo territory to the east of the Niger River at a site dated to the 9th century, making it (and, by extension, Nri) older than Ife. It appears that Nri had an artistic as well as religious influence on the lower Niger. Sculptures found there are bronze like those at Igbo-Ukwu. The great sculptures of the Benin Empire, by contrast, were almost always brass with, over time, increasingly greater percentages of zinc added. The bronzes of Igbo-Ukwu pay special attention to detail depicting birds, snails, chameleons, and other natural aspects of the world such as a hatching bird. Other pieces include gourds and vessels which were often given handles. The pieces are so fine that small insects were included on the surfaces of some while others have what looks like bronze wires decorated around them. None of these extra details were made separately; the bronzes were all one piece. Igbo-Ukwu gave the evidence of an early bronze casting tradition in Nri. Religious beliefs were central to the Kingdom of Nri. Nri oral tradition states that a bounty of yams and cocoyams could be given to the eze Nri, while blessings were given in return. that is the levites,It was believed that Nri’s influence and bountiful amount of food was a reward for the ruler’s blessings. Above all, Nri was a holy land for those Igbo who followed its edicts. It served as a place where sins and taboos could be absolved just by entering it. Even Igbo living far from the center of power would send abnormal children to Nri for ritual cleansing rather than having them killed, as was sometimes the case for dwarfs or children who cut their top teeth before their lower teeth. Right from here in the United States, we are shocked by the pictures showing the level of depravity on the part of the Nigerian security forces in their response to the attempt by some Igbo youths to mark the anniversary of Declaration of Biafra by Colonel Ojukwu on May 30, 1967. The pictures are shocking, yet very eloquent in depicting the Nigerian government as one without parallel in cynical brutality in modern times. How can human life be so debased to this lowest level like in the pit of hell? How can a government order its army against its own people in such a blood-culling manner and perversity? Yes, the State has a duty to maintain law and order. But above all, the State has a duty to honor and respect human life and dignity. There is no doubt, judging from these pictures and stories, that the Nigerian State has lost it. It is fast turning into a bloody land of the wicked leaders. Thing should go on like this. Nothing short of a full and detailed investigation should be conducted to establish what actually happened. This government has to reaffirm its commitment to the constitution and rule of law and the liberty and freedoms of man. This is extremely alarming and the world must take note. Nigeria is sinking to unprecedented levels in banality and state-sponsored terrorism. Yes, you don’t like them to talk of Biafra, but this not how to go about stopping them. If the death of over two million between 1967 and 1970 did not stop it, when will a reasonable realize that it cannot be stopped with bullets. The government needs to dialogue, educate and persuade and make necessary changes in the constitution to create a sustainable unity. This government must show it has intellect and imagination. Killing these unarmed people is actually a sign of weakness, not strength, on the part of the State. Diochi Man from Isuochi.Diochi is a palm wine tapper.and Isuofia Woman.as we knows that Ohia.or Ofia.Is bush.isuofia woman isuochi Man.